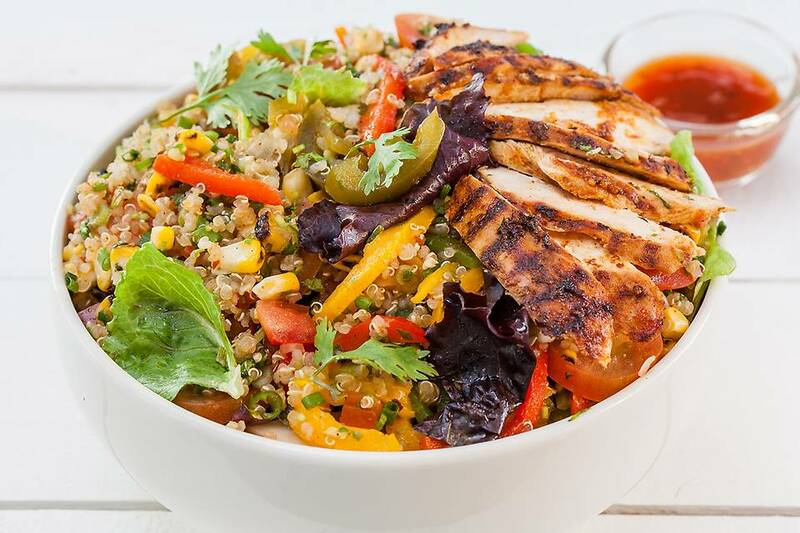 Here's a delicious salad which stars the goodness of chipotle-grilled chicken steaks, paired with a colourful ensemble of charred sweet-corn and fresh peppers tossed in chipotle-chilli vinaigrette and placed on a bed of quinoa and lettuce. Marinate the chicken with salt, pepper, and lemon juice. Add the chipotle seasoning. Grill it and cut it into thick strips. Roast all the bell peppers take out skin. Before adding it to the salad strain out the excess water from it. Take a clean bowl mix all the ingredients mentioned for the salad, add the fresh, mixed lettuce. Add chopped coriander, chopped spring onion and fresh basil. Adjust seasoning, add paprika powder. Take a clean bowl, add the vinaigrette, chipotle tabasco sauce, salt, pepper, lemon juice and a pinch of paprika powder. Whisk it well and refrigerate it. Serve the salad with the dip on the side. Burgers to make your day better!